All powder and bulk solids processing and handling equipment or systems require some degree of monitoring and control. The more complex an industrial process becomes, the more important it becomes that it is correctly controlled and monitored. This is where instrumentation and control systems are crucial. Silo contents measurement is a key area. Because the bulk density of silo contents may vary, level indication and level detection instrumentation is vital to prevent overfilling. In other industrial processes, controls need to be able to react to explosions, system blockages, sifter screen breakages, metal detectors, over-heated mills, etc. and take the appropriate action to prevent system damage or compromise to product quality. 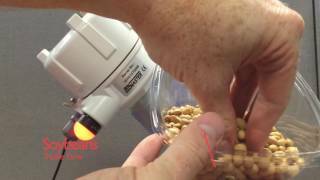 The DustAlarm ES and DustTrend ES, Monitor Technologies’ next generation of broken bag detection and dust emission trend monitoring systems, have an easy auto set-up function that is activated by pressing a button to automatically configure parameters / alarms. GLOUCESTERSHIRE – In a new online presentation Tim Freeman, Managing Director, Freeman Technology, introduces uniaxial powder testing; explaining the measurement methodology and presenting example data. Key features of the instrument and their potential benefits are discussed including the offline Consolidation Station, an accessory that significantly enhances the productivity of investigations into the impact of storage and environmental conditions. LINCOLN, NE – BinMaster’s Flow Detect 2000 is a flow / no flow sensor used to detect the flow of powders and bulk solids in your processing. It can be used as a preventive control to comply with FSMA. 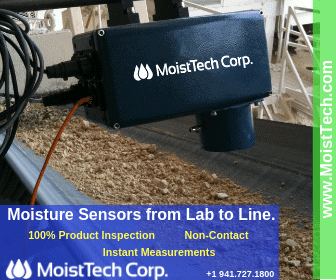 SARASOTA, FL – Moisture content varies widely in raw materials, and at different points in the production process, so non-contact moisture measurement is essential for achieving an outstanding final product. Adrian Fordham (MoistTech Corp.)Adrian is currently the President of MoistTech Corp and has been with MoistTech Corp. since 2010 starting as the Sales Manager. Bringing to the company many years of experience and expertise in multiple industrial moisture applications, Mr. Fordham has vast knowledge in Near-Infrared moisture sensing and detection technology. James Seagraves (Eastern Instruments)James is an veteran of solids flow measuring process design with over 27 years of experience under his belt. He is a recognized expert in flow-metering and feeding applications in a wide variety of sectors across a multitude of industries, including the food, chemical and building supply industries. Nathan Grube (BinMaster Level Controls)Nathan Grube is Regional Vice President of Sales for BinMaster covering the central United States including a ten-state area stretching from North Dakota to Texas. He joined BinMaster in 2001, already equipped with five years of experience in agricultural equipment. Grube has worked with end users, distributors, and OEMs across the US. His vast expertise covers many industries including agriculture, aggregates, cement, plastics, and mining, among others. For the production of hygiene products, the required fibre material has to cover long conveying distances. Automation systems are more accurate than any person ever can be. By automating berth stockyard operations, BlueScope Steel cuts operational costs, maximizes stockyard area utilization, boosts throughput and hedges against uncertainty.